4 boiled potatoes slightly mashed. 1 tablespoon dry mango powder. 1 tablespoon Olive oil or Mustard Oil. Add oil to cooking pot on low flame and once heated , put in the cumin seeds and asafoetida(Heeng) powder. Add the spices (salt, pepper,coriander, cumin , turmeric, chili powder) and fry for a minute on low flame. Add the chopped tomatoes and cook until they are soft . Then add green peas, cover and cook for 5 mins . Lastly add the mashed potatoes, 2 cups of water and mix well. Sprinkle the Garam Masala and Dry Mango Powder. Cover and cook on low flame for about 10 minutes till you see a thick gravy . 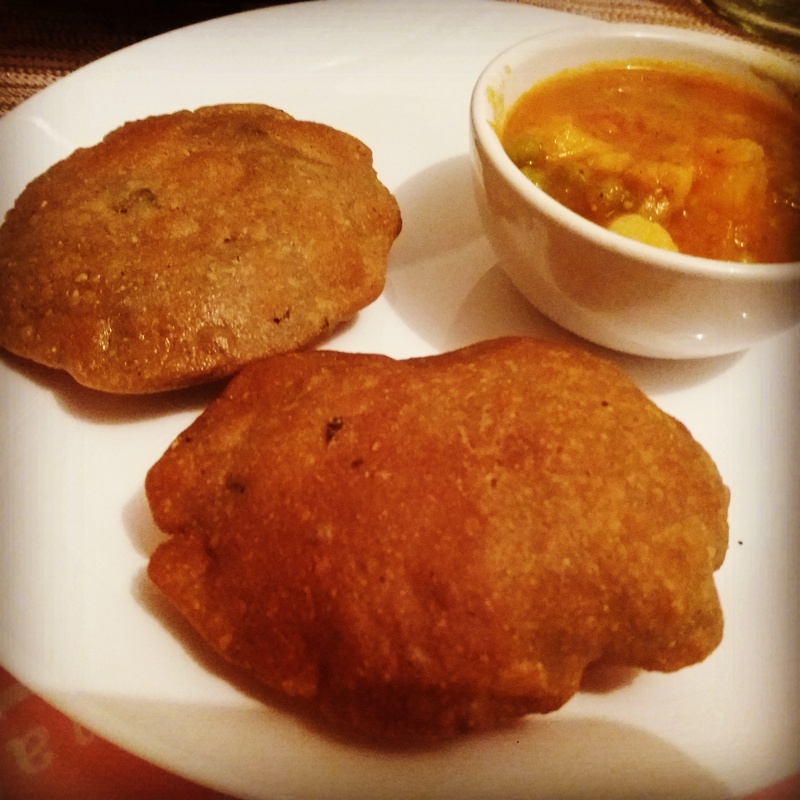 Eat it with paratha or puri ( both are indian bread) you can enjoy it with boiled rice as well. 1 and half cup medium hot water to knead the dough. Add all the above ingredients and mix well, knead the dough with medium hot water carefully as not to burn your hands . 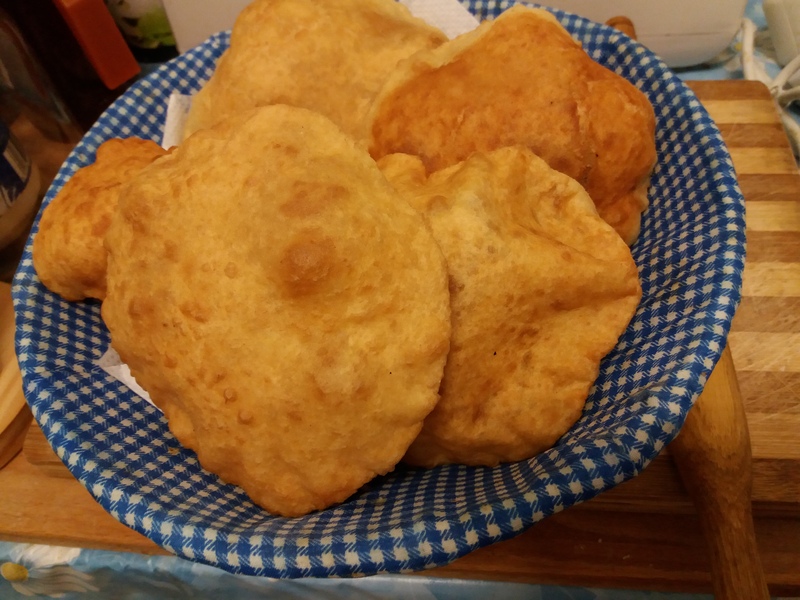 It is a bit difficult to roll out Bajra roti or poori since there is no gluten present in the Bajra , we have added some normal flour in the beginning to make it a bit easier to roll out the poori. 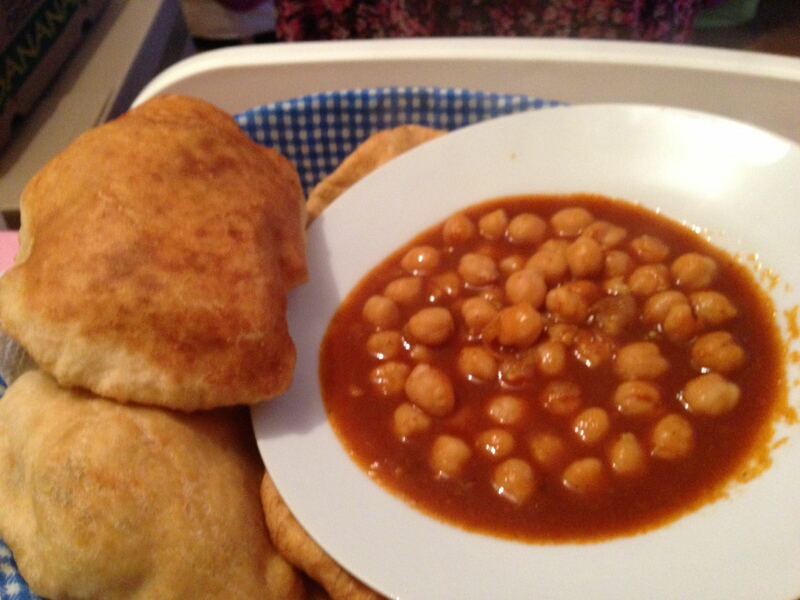 Similarly roll out the remaining poori and fry them. Jumbo Prawns (15-20) cleaned and peeled . Olive Oil for cooking -2 big table-spoon. Heat oil in pan, add chopped onions first saute for a minute and then add ginger garlic paste and chili. Fry the onions until you see them turning slightly brown. Add the cashews and saute for a minute till they get slight golden colour. Start adding spices :red chilli powder,turmeric,coriander powder , salt, pepper, garam masala. Saute for a minute then add tomato puree. Once you see oil is separated from gravy,turn the gas off. Cool and grind it into a fine paste , it now has more creamy and consistent gravy texture. On a flat plan, add one tablespoon of oil, add the crushed coriander seeds, cumin seeds, mustard seeds, one chopped pod of garlic and curry leaves. Once the mustard seeds splutter add the prawns and let the prawns cook for 5-10 minutes on medium flame. Add these cooked prawns into the gravy , mix well and simmer it on low flame covered for 5 minutes. Garnish with chopped coriander . Your masala Prawns are ready , you can enjoy it with steamed rice or naan. Another hit of the day 🙂 Doodh soda or Milk Soda. One of my pakistani friend introduced me to it and I was like..what ! How wierd that will be Milk and Soda..how can you drink that fizz in the milk ! She was like you have to try it Sana..so voila here I am with the instant recipe and drooling over this chilled Milk Soda..
My 5/5 Rating to her recipe. good for summers and upcoming Ramadan. You will love the taste ! Put milk ,sugar and cardamom powder in a jar and blend ( manually or via electric blender ). Add in the sprite and mix well. The liquid will rise so your Jar has to be deep enough to avoid overflow . Oil for cooking – half cup. Put oil and ghee in the cooking pot on medium flame , add in the sliced onions and fry them till light golden brown. Add in ginger garlic paste and fry for a minute. Add chicken pieces to the pot and fry for another few minutes. Start adding spices : salt, pepper, chilli powder,turmeric,coriander powder and nihari mix .Saute for some time till you see oil separates from gravy. Check if chicken is tender enough , You have to cook it till the chicken flesh start separating from the bones . Roast the normal wheat flour till golden brown in a pan and mix with one cup of water and add to the nihari pot and stir well till liquid starts thickening. Cover and cook for another 15 minutes . check for the salt and add if necessary. ( There is salt already in the Nihari mix as well so check before adding salt ) . Turn off the flame , Garnish with chopped coriander, chillies ,ginger and lemon and some fried onions . Your chicken Nihari is ready , you can enjoy it with steamed rice or naan. The dish is also cooked with beef and mutton but they takes way more time around 6-7 hours since it is slowly cooked on low flame.